Delivery in approx:	If you order by noon your mug can be collected from store in the afternoon! Heart-handled mugs and orders shipped to home take approximately 7 days. 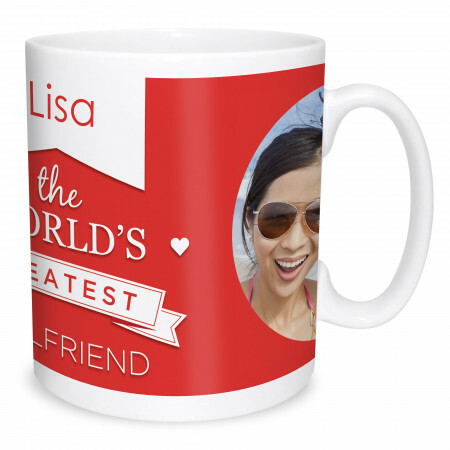 Show them how great you think they are with one of our circle photo personalised mugs. Create the perfect gift for someone with one of our personalised mugs. Brighten your own coffee breaks or someone specials. A treasured photo on a mug will never fail to bring a smile to your face. Our 10oz ceramic mugs have a polymer coating as well as having four colours to choose from for the handle and rim of the mug. If you order by noon your mug can be collected from store in the afternoon! Heart-handled mugs and orders shipped to home take approximately 7 days. Delivery of this product in approx:	If you order by noon your mug can be collected from store in the afternoon! Heart-handled mugs and orders shipped to home take approximately 7 days.